In 1975, Maharishi inaugurated the dawn of a new era, proclaiming that 'through the window of science we see the dawn of the Age of Enlightenment'. Scientific research found that in cities and towns all over the world where as little as one per cent of the population practises the Transcendental Meditation Technique, the trend of rising crime rate is reversed, indicating increasing order and harmony. Research scientists named this phenomenon of rising coherence in the collective consciousness of the whole society the Maharishi Effect, because this was the realization of Maharishi's promise to society made in the very early days of Maharishi's Movement (started in Madras, India in 1957). This global research demonstrated a new formula: the square root of one per cent of a population practising Transcendental Meditation and the TM-Sidhi Programme, morning and evening together in one place, is sufficient to neutralize negative tendencies and promote positive trends throughout the whole population. Research has shown that groups of individuals practising Yogic Flying—all enjoying very high brainwave coherence—create coherence in collective consciousness, and generate a unifying and integrating effect in the life of society. This results in a decrease of negative trends throughout society—such as crime, accidents, and sickness —and an increase in positive social, economic, and political trends. Scientific studies on this phenomenon have demonstrated that a group of at least 7,000 individuals practising Yogic Flying can produce this coherence-creating effect on a global scale, reducing violent and negative trends worldwide. The secret of the Global Maharishi Effect is the phenomenon known to Physics as the 'Field Effect', the effect of coherence and positivity produced from the field of infinite correlation—the self-referral field of least excitation of consciousness—the field of Transcendental Consciousness, which is basic to creation and permeates all life everywhere. Through the Maharishi Effect, Extended Maharishi Effect, and Global Maharishi Effect, with positive trends and harmony rising in individual and national life, the problems of the nation will disappear, as darkness disappears with the onset of light. The Maharishi Effect, like the phenomenon of the Meissner Effect in Physics, establishes the principle that individual consciousness affects collective consciousness. A universal principle in Nature is that internally coherent systems possess the ability to repel negative external influences, while incoherent systems are easily penetrated by disorder from outside. This principle of invincibility is clearly illustrated in the Meissner Effect, and in the functioning of a nation as the Maharishi Effect. 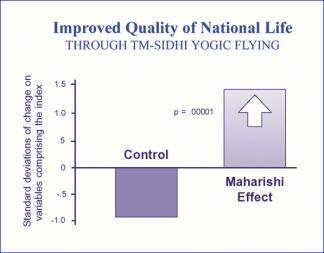 Over 600 scientific research studies conducted at more than 200 independent universities and research institutions in 30 countries have demonstrated the profound benefits of Maharishi's Transcendental Meditation and TM-Sidhi Programme for all aspects of individual life and the well-being of society. These studies have been documented in over 5,000 pages of Scientific Research on Maharishi's Transcendental Meditation Programme—Collected Papers, Volumes 1—5 (Volumes 6—7 are in progress). Following are two of the over forty scientific research studies conducted todate on the Maharishi Effect—papers 318 and 333. 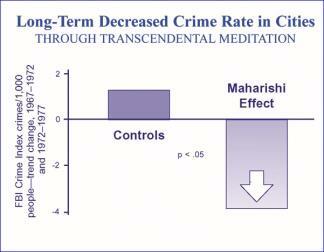 Cities in which one per cent of the population were instructed in the Transcendental Meditation Programme showed a trend of decreased crime rate in subsequent years, in contrast to matched control cities. Reference: Journal of Crime and Justice 4: 25–45, 1981. 318. DILLBECK, M.C. ; LANDRITH III, G.; and ORME-JOHNSON, D.W. 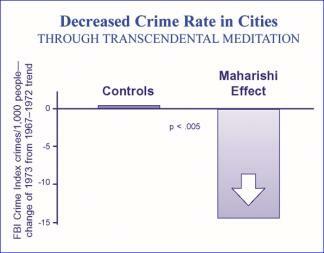 The Transcendental Meditation Program and crime rate change in a sample of forty-eight cities. Findings previously published in Journal of Crime and Justice 4: 25-45, 1981. Quality of life in Israel improved significantly, as measured by an index comprising decreased crime, increased Tel Aviv Stock Exchange index, and improved national mood (analysis of daily news), when a large group was participating in the Transcendental Meditation and TM-Sidhi Programme in Jerusalem. Reference: Journal of Conflict Resolution 32: 776–812, 1988. 333. ORME-JOHNSON, D.W.; ALEXANDER, C.N. ; DAVIES, J.L. ; CHANDLER, H.M.; and LARIMORE, W.E. International peace project in the Middle East: The effect of the Maharishi Technology of the Unified Field. Journal of Conflict Resolution 32: 776-812, 1988.